Moderate on trail; easy to moderate on greenways and roads. The road and greenway stretches are ideal for traveling by bicycle; on the trails, the Owls Roost Trail is highly technical mountain biking, but cycling is prohibited on all other trails in this segment. Check Trail Updates before starting your hike. 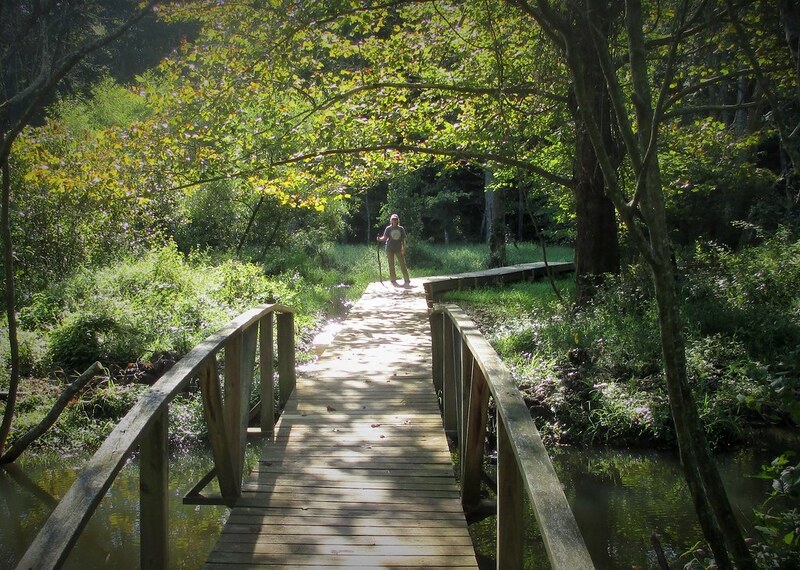 This 64-mile MST segment allows hikers to explore the peaceful countryside and small towns of Piedmont North Carolina just north of Winston-Salem and Greensboro. 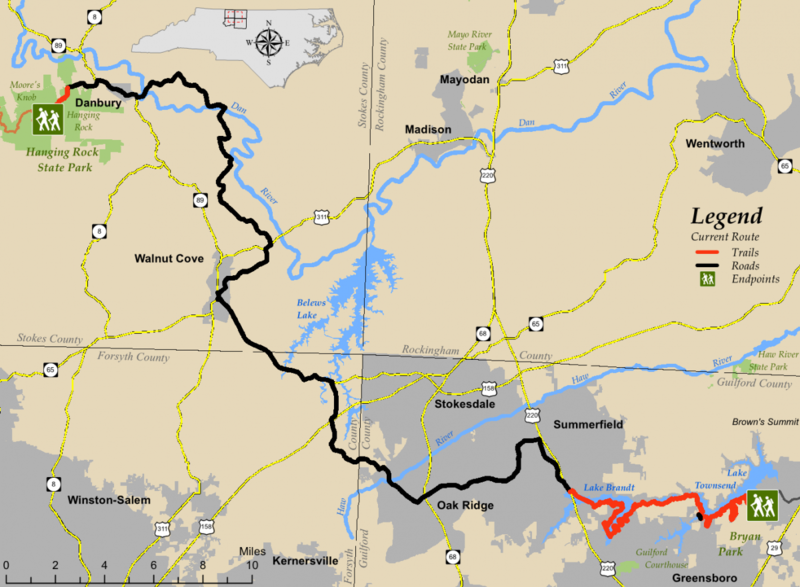 The western half of the segment roughly parallels the Dan River–from Hanging Rock State Park through the towns of Danbury and Walnut Cove to Belews Lake, built by Duke Energy on a tributary of the Dan. 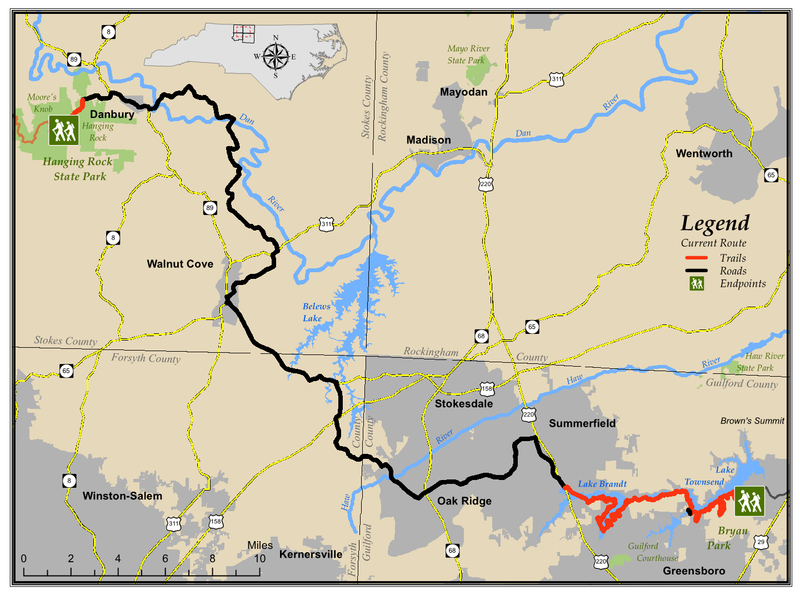 The eastern half falls within the watershed of the Haw River, and the route runs through the towns of Oak Ridge and Summerfield and then onto trails along the shores of Lake Brandt and Lake Townsend, built to provide water to the city of Greensboro. The western end of the route is at the visitor center of Hanging Rock State Park. For westbound hikers, this park will be the first taste of the mountains, and the 1.7-mile trail leading to the visitor center rises 1,000 feet past waterfalls and mountain plants like rhododendron, mountain laurel, and galax. 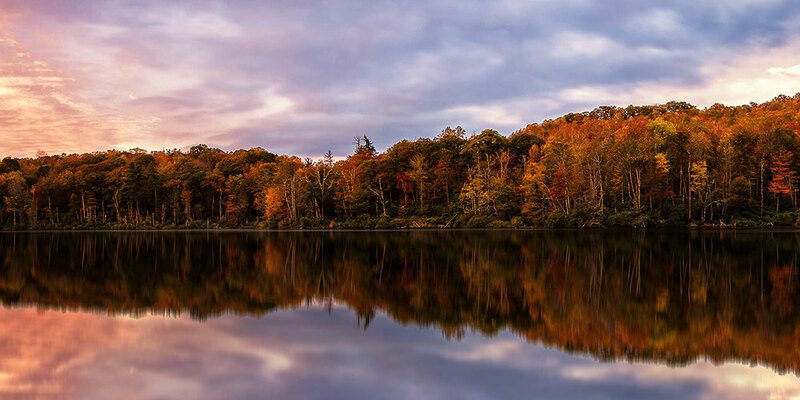 Just to the east of the park, hikers will visit Danbury, the county seat of Stokes County. The tiny town of beautiful historic buildings sits on the Dan River. In the town’s Moratock Park, visitors can see the remains of a massive stone iron furnace built in the Civil War. From the town of Walnut Cove east to Greensboro, much of this segment traces the historic route of the Atlantic & Yadkin Railroad, which ran from Mt. Airy to Sanford. You can still see traces of the old railroad bed in Walnut Cove, and you will cross a bridge over the old railroad bed on Oak Ridge Road in Summerfield. The route through Oak Ridge will take you past the Oak Ridge Military Academy, founded in 1850. The town of Summerfield is working to turn its portion of the old railroad bed into a rail-trail which will become the route of the MST when complete. As you pass through Summerfield, look for monuments to James Gillis, a 14-year-old bugle boy who was killed in a skirmish during the Revolutionary War, and to Charles Bruce, a local Patriot. The eastern third of the segment starts on Greensboro’s Atlantic & Yadkin Greenway and uses it twice to cross over Lake Brandt. From there the MST follows trails in the Greensboro Watershed Lakes complex, passing through classic second-growth Piedmont oak-hickory-beech forest still showing signs of its previous agricultural use. Nearly all of this portion of the MST is on the shores of the watershed reservoirs, and there are many beautiful vistas over the lakes. The road portions of this segment are great to explore by bicycle as well as on foot.